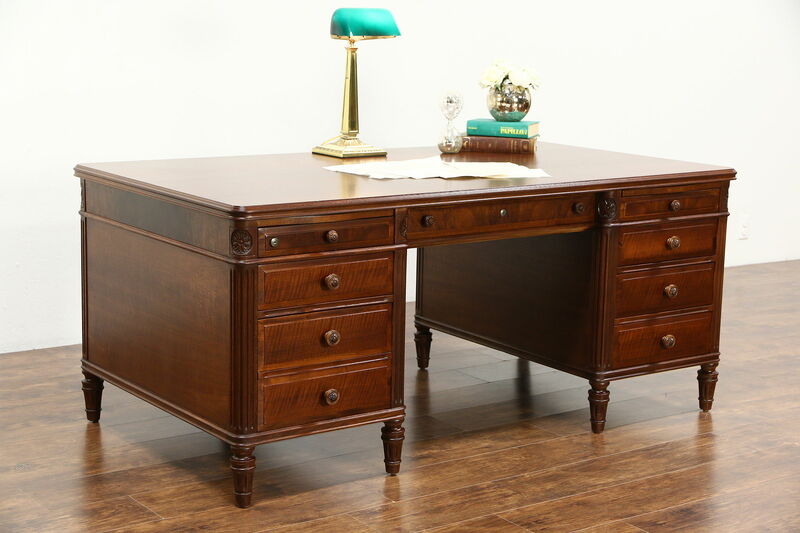 Signed by premier executive suite furniture maker, "Stow Davis," this library or office desk is matched walnut with burl panels. The restored finish is in excellent condition on this traditional American made library furniture. Fluted corner columns and carved details show exceptional quality. There is a file drawer and two pull out shelves. Drawers have dovetailed joints and original pulls. Measurements are 69" wide, 38" deep and 30" tall, the kneehole size is 27" wide and 24" tall. Please view 26 photos at full screen size for best detail. Related items in photos are sold separately.